Today we have the talented Joyce Wan, author and illustrator of many picture books and board books, and founder of Wanart, a greeting card and gift design studio. 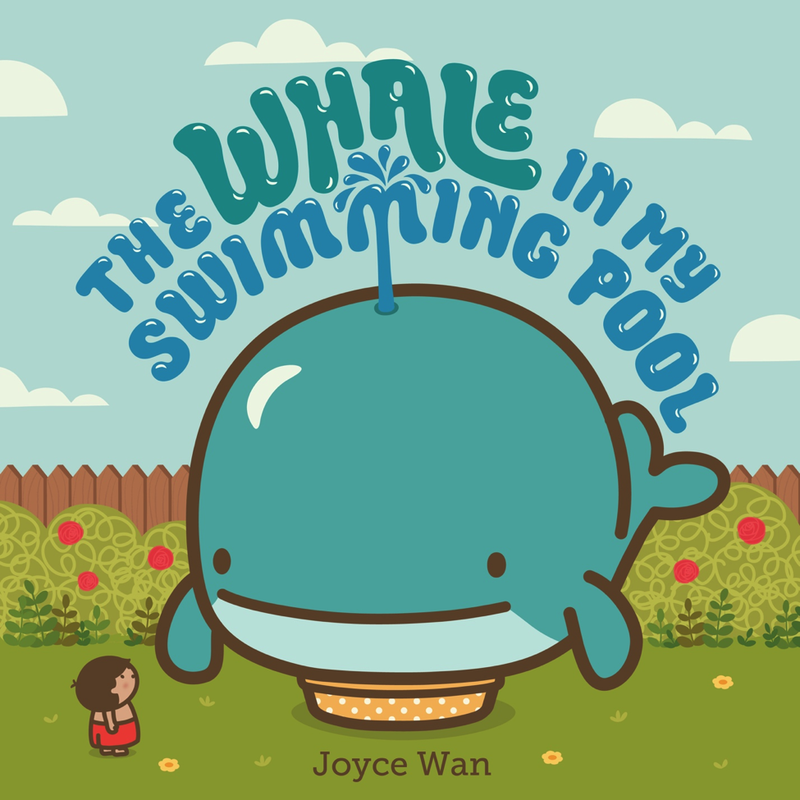 Be sure to enter her giveaway for a copy of THE WHALE IN MY SWIMMING POOL (U.S. addresses only). Tell us about your background and how you came to write & illustrate for children. Did you ever envision the career you have today when you were younger? 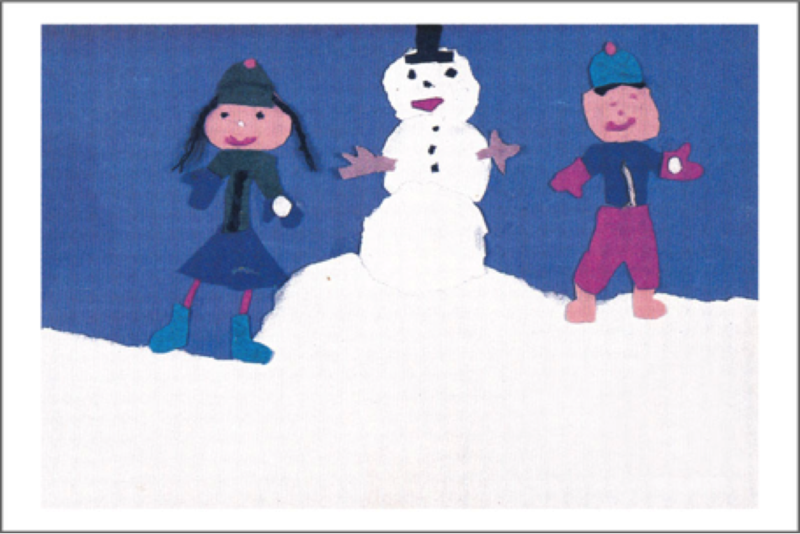 My first experience of having my work in print happened when I was just 7 years old when I won a city-wide greeting card design contest sponsored by the Art Institute of Boston. The design was 1 of 3 selected to be mass-produced and sold through a major department store. I was invited to the State House to meet the governor of Massachusetts, Michael Dukakis, and had my picture in the Boston Globe. My mom still talks about it to this day! That entire experience left such a huge impression on me and I’ve been drawing ever since. I went on to study architecture at Barnard College thinking it was the practical thing to do for someone who liked to draw and I worked in architecture for a few years. It wasn’t long before I realized what I really wanted to do was illustrate. I decided to launch a greeting card and gift design studio called Wanart in 2003 because, having no formal training or contacts in the arts, that seemed the most accessible to me at the time. I took a few continuing education courses at SVA and poured my heart and soul into my business. I created a collection inspired by Chinese culture and my childhood and exhibited at trade shows around the country. Those first couple of years, I still worked a 9 to 6 job at an architectural firm and spent many late night hours on my own business with only a few hours of sleep in between the two “jobs”. I did this for two years before I quit my full time job to pursue my own business full-time. Five years into my greeting card and gift business I met my first publisher, Blue Apple Books, at the New York International Gift Fair (now called NYNow) and my first book GREETINGS FROM KIWI AND PEAR (inspired by a greeting card line I had created showing two monkeys travelling the world) was published in 2009. 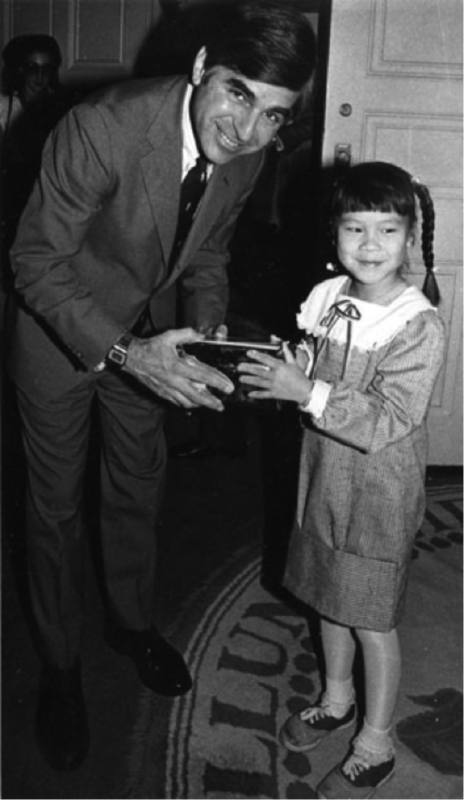 I don’t think I even dared to dream of such a career as a child as it seemed out of reach to me. My parents, having barely a middle school level education, immigrated to the U.S. not knowing any English with nothing more than a desire for a better life. My early childhood years were spent living on welfare but they eventually ended up opening their own restaurant business, owned a house in the suburbs and all four of their children went to college. I truly admire all that they were able to accomplish having started out with so little to begin with. They showed me that with courage, hard work, and determination, you can make your dreams come true. It's a philosophy that I live by and is a major part of why and how I am where I am today. Since 2009 I’ve had 12 books published and 12 more underway. It’s a dream come true. Your art is reminiscent of Japanese pop art. What has influenced your style? Like many Asian girls growing up in the 80’s (or maybe it was just me!) I had an obsession with Sanrio (the company that created Hello Kitty) characters as a child. I also watched a lot of Hayao Miyazaki films. As an adult, I’ve admired and am fascinated by the art of Takashi Murakami and Yoshitomo Nara - artists who have blurred the lines between fine art and pop art. I appreciate simple design and clean lines, characters and objects that are stripped down to their purest form and art that is bold and iconic yet lovable. 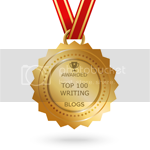 One of your recent books, A WHALE IN MY SWIMMING POOL, has received many accolades. What inspired this story? 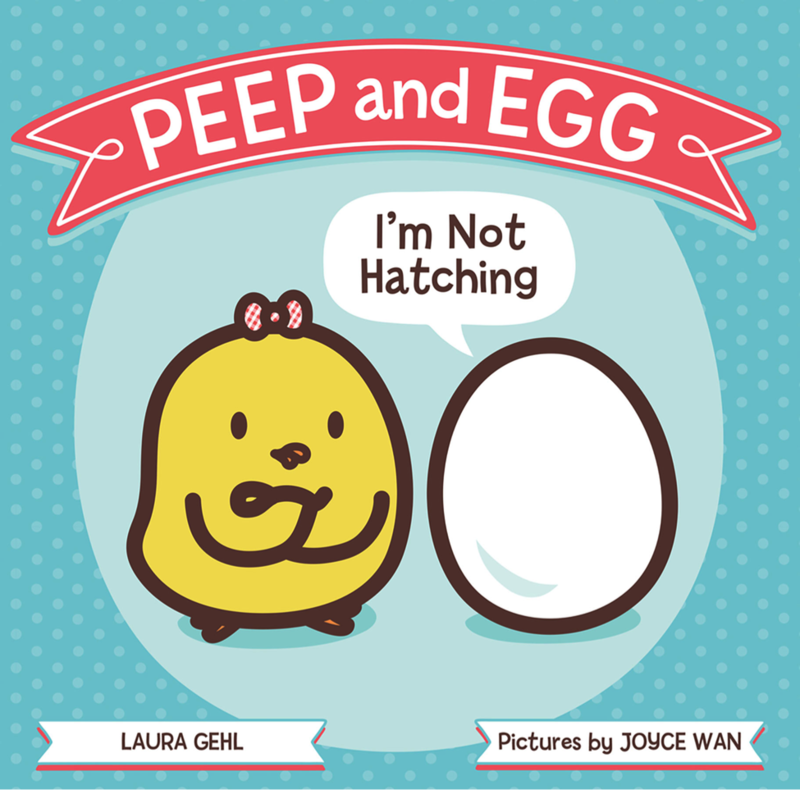 This story was inspired by my niece and nephew who were maybe 3 years old at the time – they are 11 now! I can’t remember how it started exactly but one day we started joking about how there was a "monkey in my elbow” and a “cat in my eye” and they would burst into fits of giggles upon hearing these silly phrases. Soon after, a vision of a giant whale in a tiny swimming pool popped into my head and it made me laugh out loud. I decided to run with it to see how far I could take it. I ended up dedicating the book to them. What other projects are you working on? Do you have new books coming out? 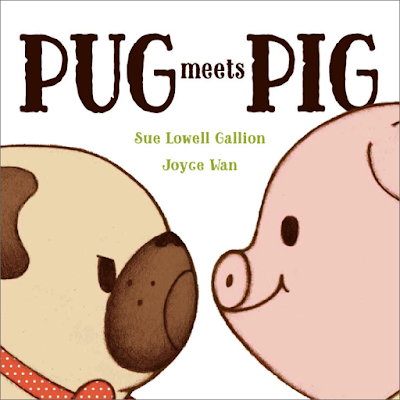 I recently completed 3 picture books and 2 board books. 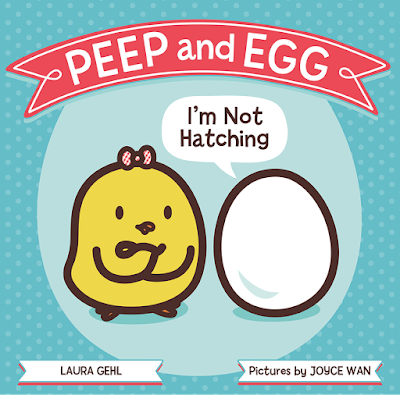 Two of the picture books, PEEP & EGG I’M NOT HATCHING (Feb. 2016) and PEEP & EGG: I’M NOT TRICK-OR-TREATING (Aug. 2016) are both written by Lauren Gehl and will be published by FSG/Macmillan. The third picture book is called PUG MEETS PIG (Sept. 2016) and is written by Sue Gallion and will be published by Beach Lane Books/S&S. 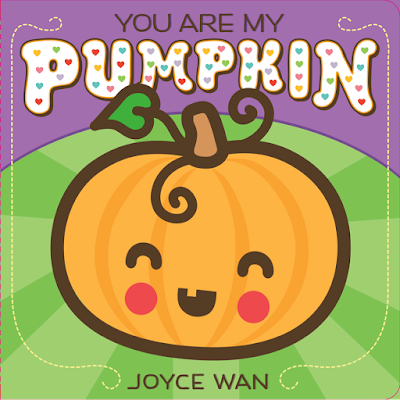 My next two board books YOU ARE MY PUMPKIN (June 2016) and YOU ARE MY MERRY LITTLE CHRISTMAS were written and illustrated by me will be published by Cartwheel/Scholastic. I can’t wait to share these books with the world! 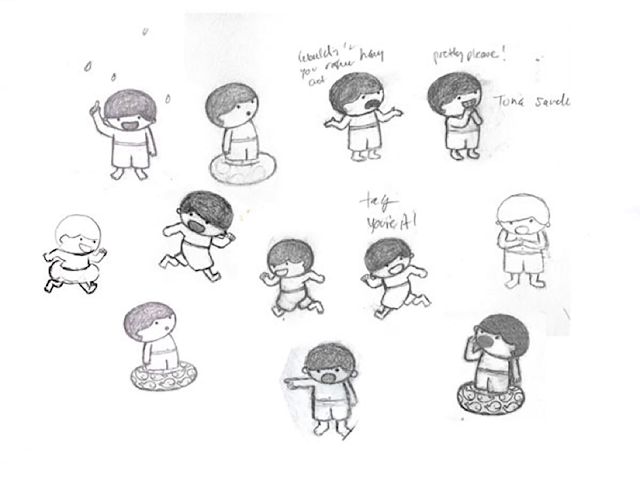 Can you walk us through your typical illustration process? My process depends on what what type of book I’m working on. With my board books, I usually have a concept first, write the copy, draw thumbnail sketches for each spread including ideas for typography in pencil, and then take it to finish digitally in Illustrator with details like background patterns and colors figured out in this stage. In between each step I submit what I have done to my editor for feedback and approval. For my picture books, I do a character study if there is a recurring character. 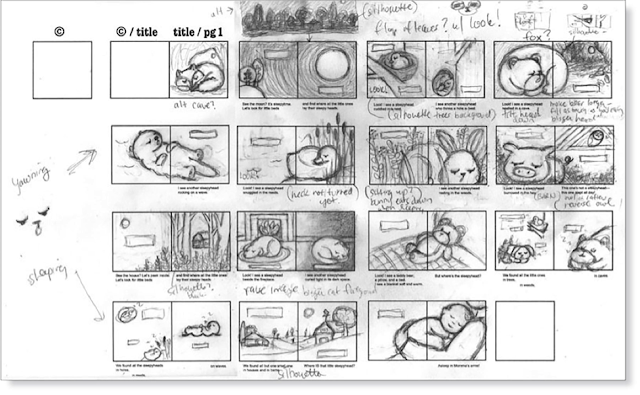 If not, I go straight to storyboard in thumbnail size which mainly helps me figure out composition and pacing. Then I draw each scene larger and in more detail, sometimes multiple times. 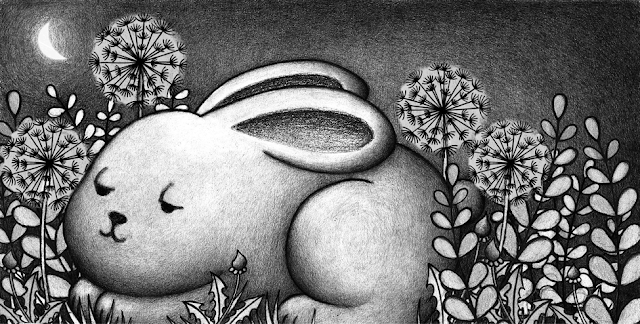 Then depending on the project I create finishes by rendering final pages at full size in pencil (I may even draw elements of a scene and piece it together in Photoshop), scanning those pages, and adding color in Photoshop (SLEEPYHEADS and PUG MEETS PIG) or I create finishes, both line and color, in Ilustrator (THE WHALE IN MY SWIMMING POOL and PEEP & EGG). What advice would you give other authors and illustrators? Join SCBWI and try to attend as many events and conferences as possible, have the courage to keep putting yourself and your work out there, surround yourself with people who believe in you, focus on and promote what you do best, don’t pay too much attention to what the next person is doing, never stop learning, and keep drawing/painting/writing – the more you do the better you get! I also believe that you have to work really, really hard, probably the hardest you’ve ever had to work. Go the extra mile in every single thing you do and everything you put out there. A piece of advice I was given that always helps me tackle the dreaded “blank page” whenever I start a new project is something Arthur Levine said once at an SCBWI conference which was "Give yourself permission to be imperfect — at least at first." Also, don’t forget to have fun – remember that it’s not a race, it’s a journey so might as well make it a fun adventure! I hold my pen/pencil the “wrong” way. I guess I was absent that day in school! Joyce Wan is an award-winning author and illustrator of many best-selling books for children, including YOU ARE MY CUPCAKE, WE BELONG TOGETHER, and THE WHALE IN MY SWIMMING POOL, which was a Junior Library Guild Spring 2015 selection. 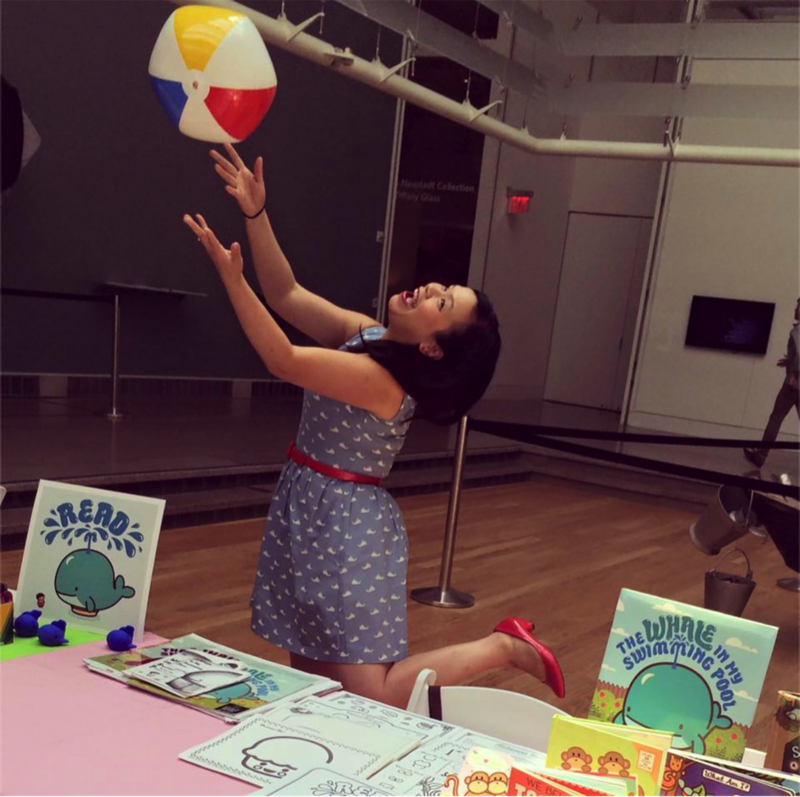 When she’s not working on books, she teaches courses at The School of Visual Arts in New York City. 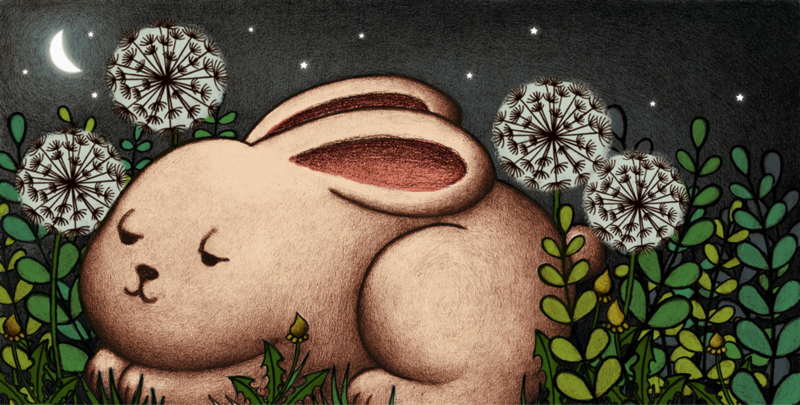 I'm so in love with your gorgeous illustrations. They are just delightful. Thank you for your inspirational story. Thanks for the interview. You and your parents are quite inspiring! So inspiring! What a delightful interview and I learnt some more about you! Wonderful piece and congratulations on a successful career. I have such a hard time getting started, staring at that "blank" page. 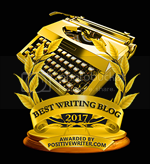 I'll remember your words when I start my next manuscript! Thanks for a fun and informative interview. I absolutely love the cover of The Whale in My Swimming Pool. I can't wait to read it. Thanks for the inspiration and advice! Such cute work. Thanks for sharing your process. SLEEPYHEADS would make a perfect baby gift. I love your bunny illustration! I love your illustrations and appreciate hearing your story! Special attention must be paid by corporate event planners to the aim of particular corporate events. If you are launching a new consumer product. Then the client has to be assured to buy the product by using some impressive ideas. 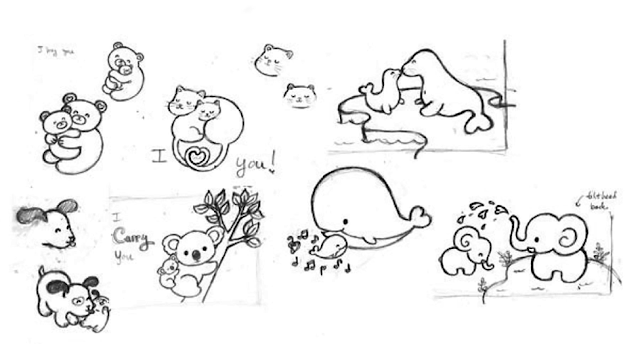 Great ideas, adorable art! Thanks for a wonderful post.